while booking a hotel in madrid for the first time, you always wonder which area will fit best to your needs. 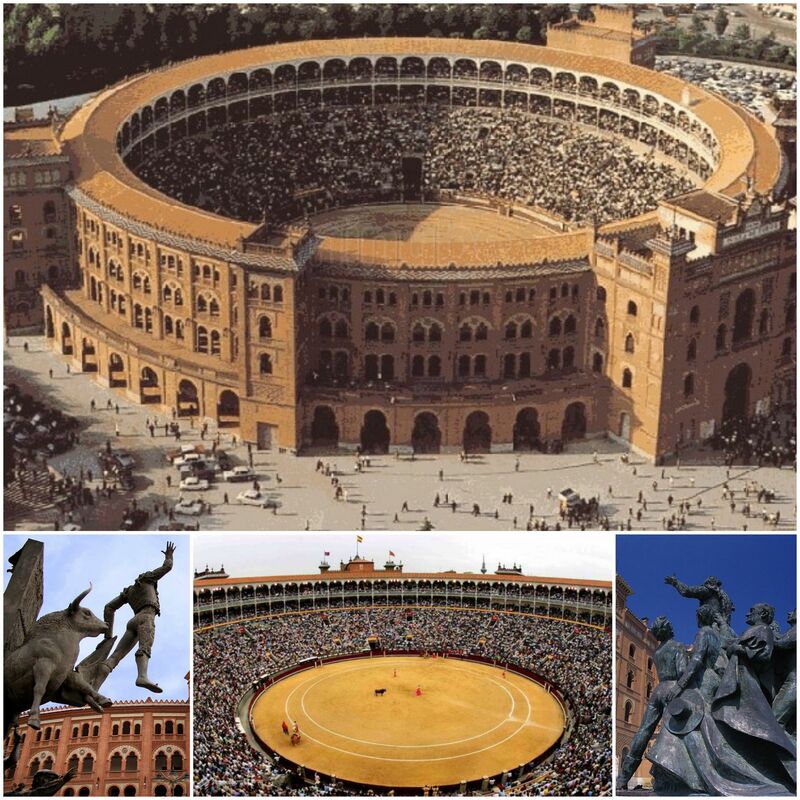 not only for the holiday-lovers, but also if you want to move to the capital or just want to know how to spend your day perfectly, it is useful to gather information of the different areas of spain. with more than 3 million residents, every area has its own characteristics and uniqueness. we divide the area into three different main characteristics: most exclusive, trendy and the competitors. 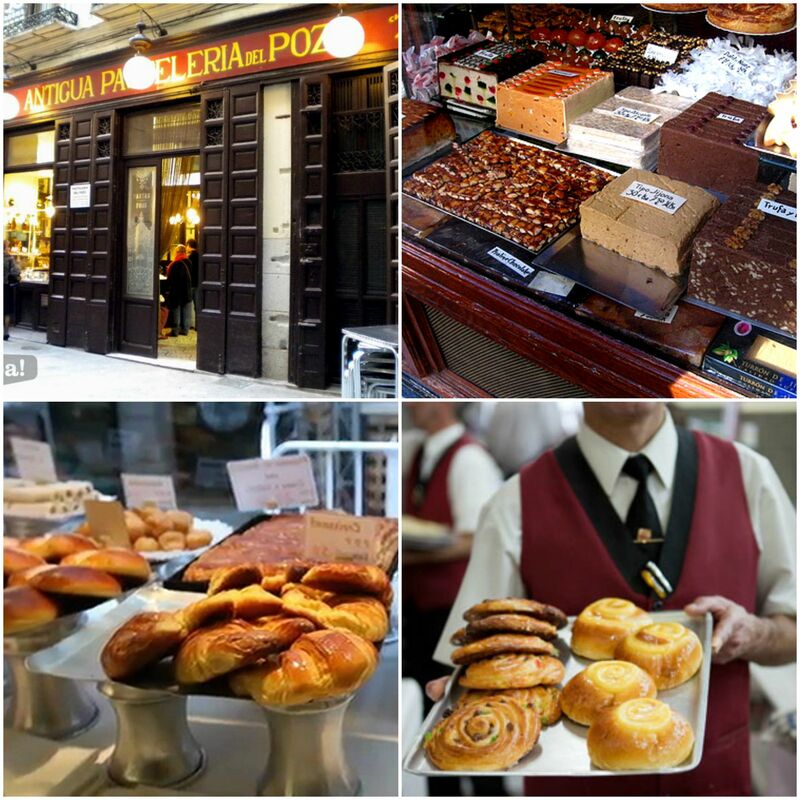 every characteristic has different areas what can help decide where to go in madrid. a chic and luxury traveller or a professional may want to secure accommodation in salamanca or castellana, some of the most expensive areas in the city. the broad thoroughfares are lined with designer shops, stylish boutiques and upmarket restaurants. not only for the more posh-people, but this area is beautiful to walk through as a tourist and to explore the luxury part of madrid. the us embassy is found here and the district´s wide highway and tall buildings are the headquarter of many banks and companies. serrano street and calle goya are the most busy and luxury shopping streets in Salamanca, both with an upmarket high street feel. serrano has just emerged from a bit of a revamp, aimed at making the whole shopping experience more pleasant. 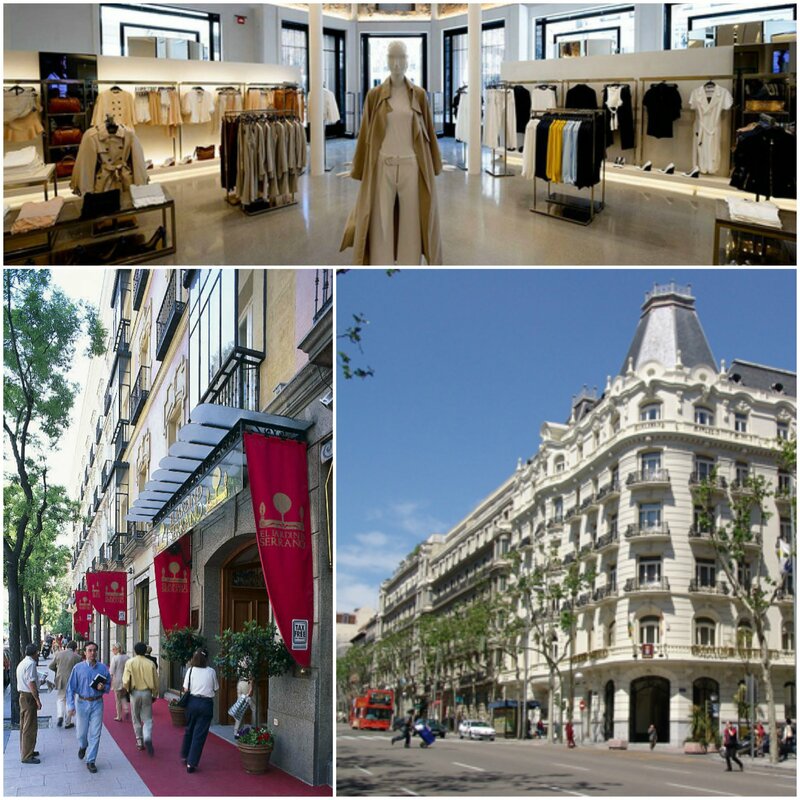 the poshest part of madrid, with the best restaurants, the most expensive shops and lounge bars. 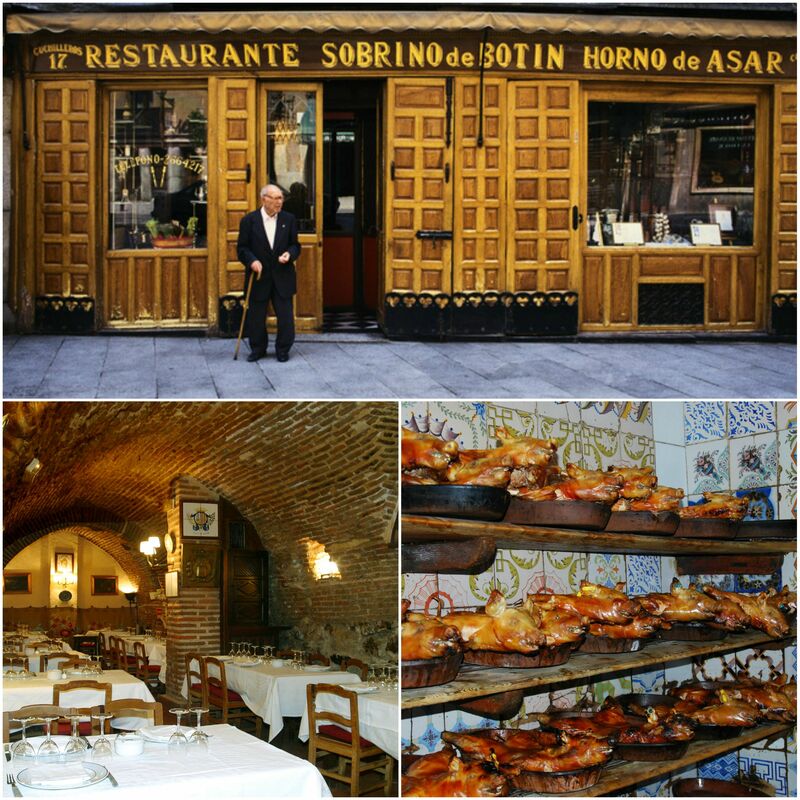 it is also a traditional neighbourhood of madrid where you can enjoy typical madrid food in many places. the oldest part of madrid, between the palace, the cathedral and the opera. you will have access to many great restaurants and green spaces. letras is a neighbourhood with a long intellectual history, known for its traditional tapas bars and partying along calle huertas. 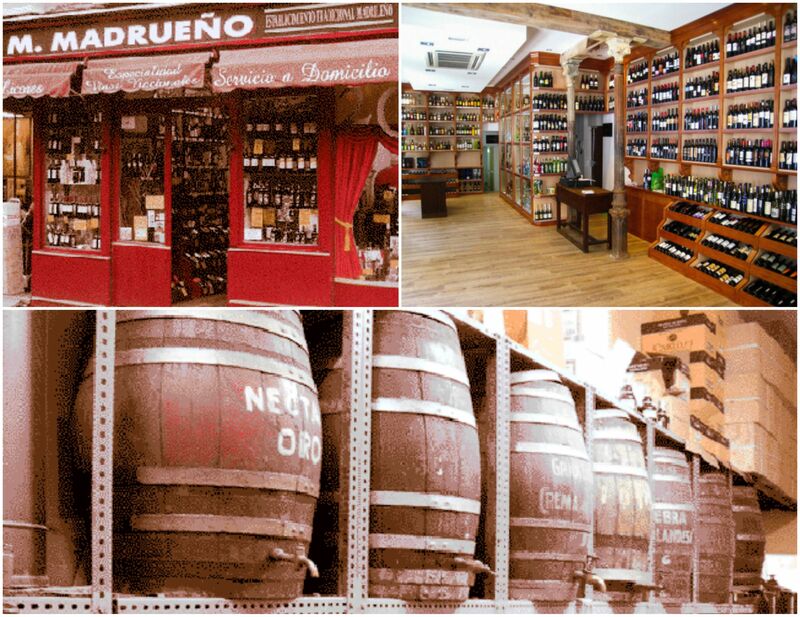 the trendy area of madrid is for the typical student or for the ones that want to avoid the touristic sightseeing. it is famous for its non-touristy alternative area and it is getting popular every day. 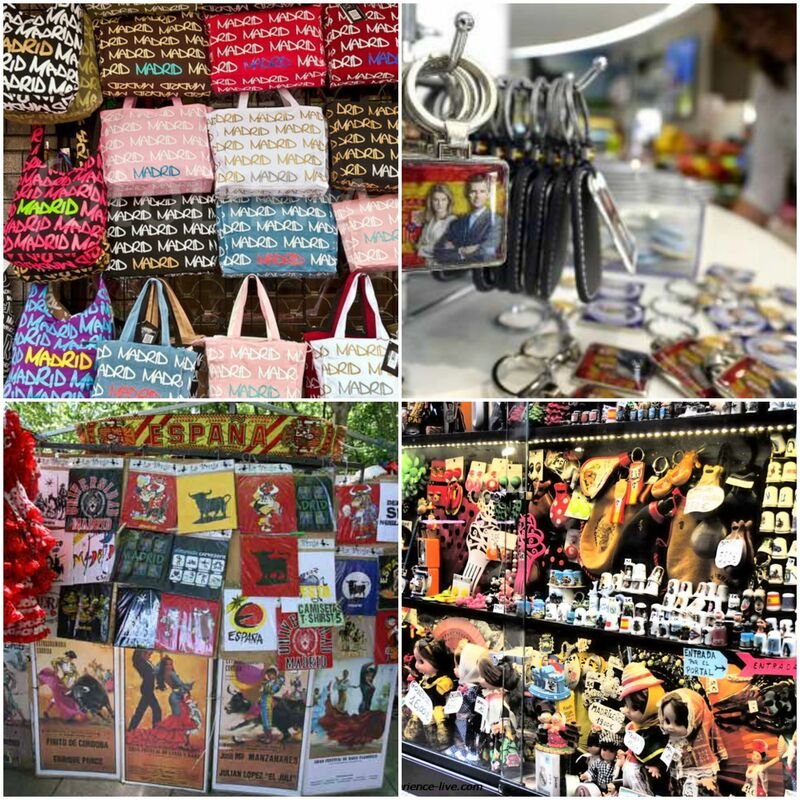 wander through the streets for glimpses of street art, second hand shops and even pop-up stores. 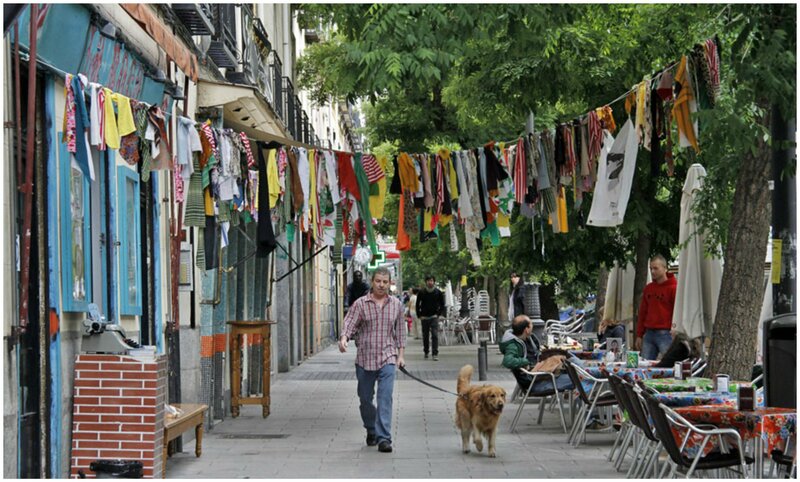 famous in madrid for its bars and artist population, malasaña is the neighbourhood for the gentrified, the alternative and people who like to be in the middle of things, should it be party, alternative art and music, or the city itself. famous for its gay population, but it is in fact much more than this. 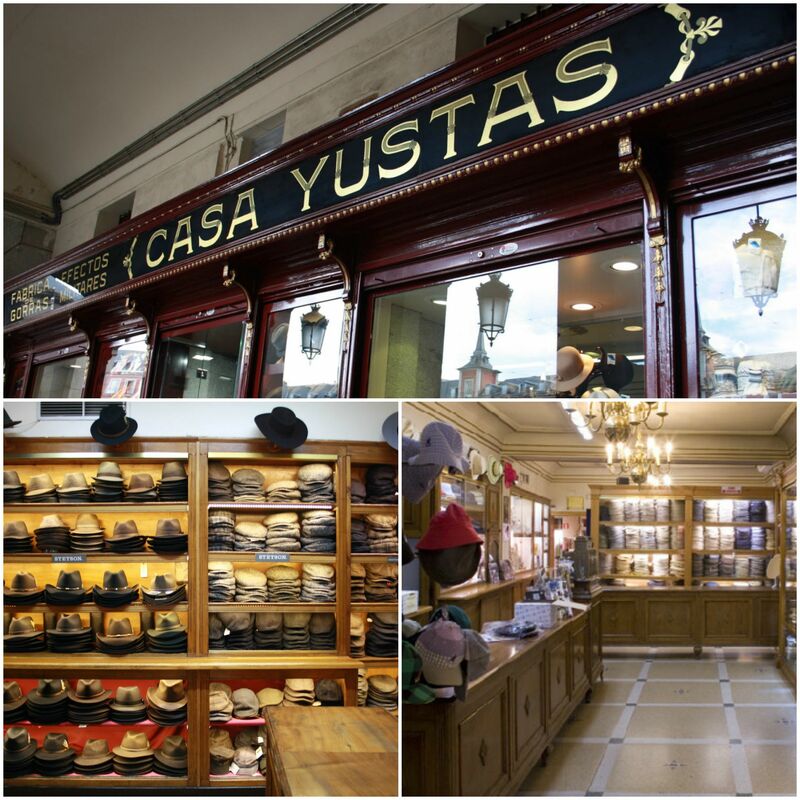 old typical madrid buildings, with quaint bars, calm coffees and a bit more laid back and diverse than malasaña. typical old buildings, a vivid neighbourhood life, coupled with the most famous street for tapas and Madrid’s huge flee market. 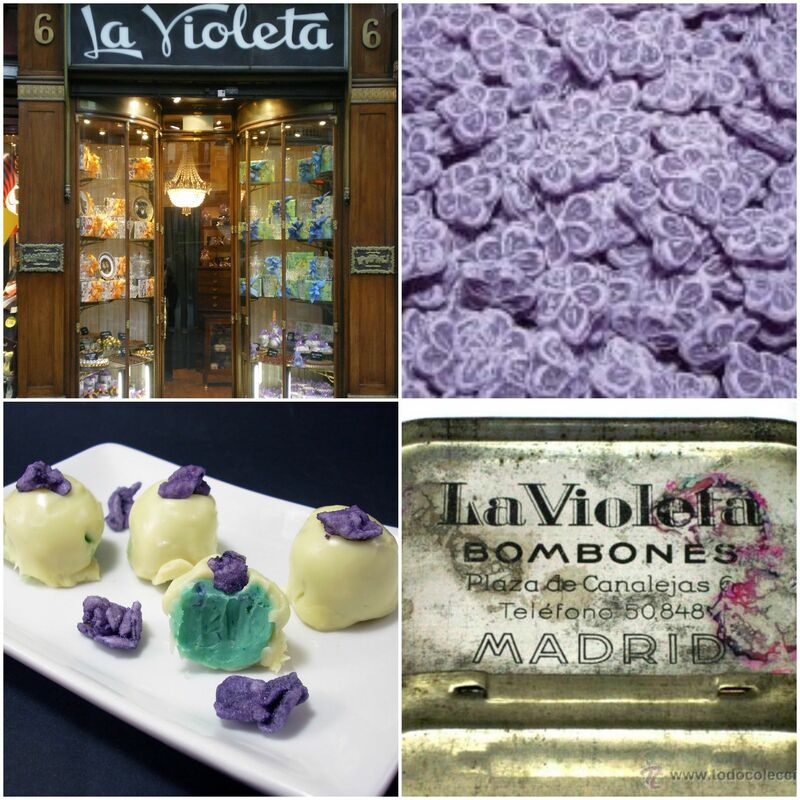 sol, nickname of the neighbourhood around the puerta del sol, is the very centre of madrid. sol is a great place to live as a your first neighbourhood and if you want to discover madrid but still feel you need to stay close to international and english-speaking restaurants, shops and bars. 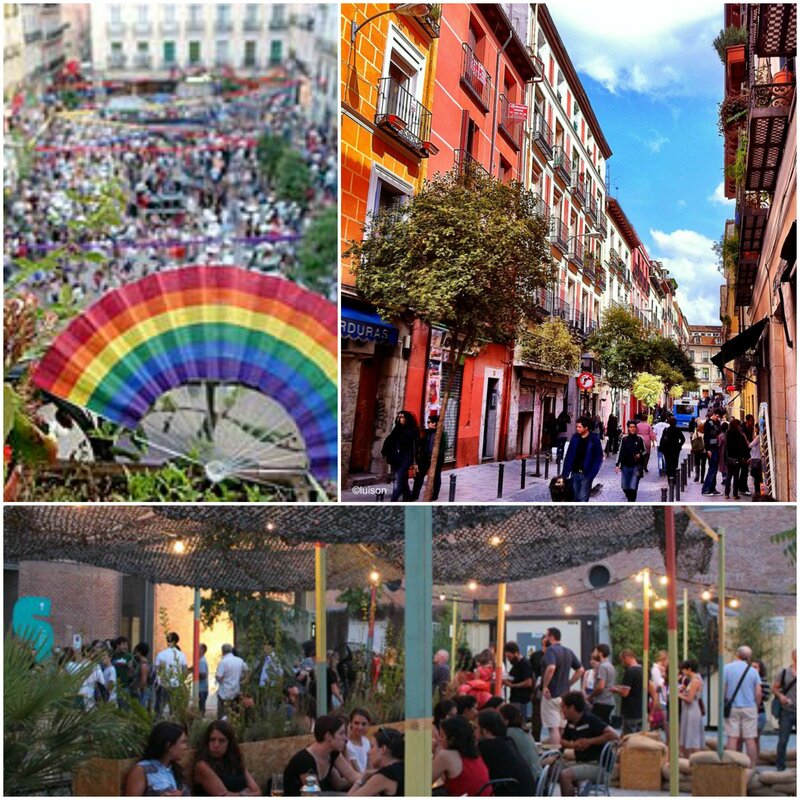 malasaña is a vibrant neighborhood and a center for the ‘hipster’ phenomena, full of lively bars and clubs overflowing with young people. its streets are currently being renovated, making it a much more attractive quarter. it’s one of the classic areas for partying the night away. these areas could be called as ´upcoming´ as they are not known by everybody, but they are getting more popular to experience another expression of the city. this area has a lot to offer and especially for the outdoors among us: there are a lot of nice parks and avenues and not a lot of tourists are aware of the inner-beauty of these places. lavapies starts just south of the very centre of madrid, from the tirso de molina square which marks the start of this neighbourhood, and goes south until the metro station of embajadores. it is a diverse neighbourhood, with a large indian and african community, but it is also still known for its traditional bars and shops like the butcher. a neighbourhood which still lives the traditional madrid way, with local markets, no lounge bars and only the typical tapas restaurants where madrileños are enjoying with friends. not as fancy as malasaña, or as posh as salamanca, but it is another quintessential neighbourhood like la latina. a traditional neighbourhood with universities close by and plenty of parks just five minutes walking: debod’s temple park, parque del oeste and casa de campo. a great place if you are looking for a quality quiet neighbourhood, not too expensive, with plenty of parks nearby and very close to the centre. the neighbourhood is defined by the massive park in the middle of it. retiro is quite expensive, with great restaurants in its surroundings, “modern” buildings compared to the city center, and the park is always near to enjoy a stroll. careful with the eastern part of the neighbourhood, which is not so well connected with the city centre as you think it should be. 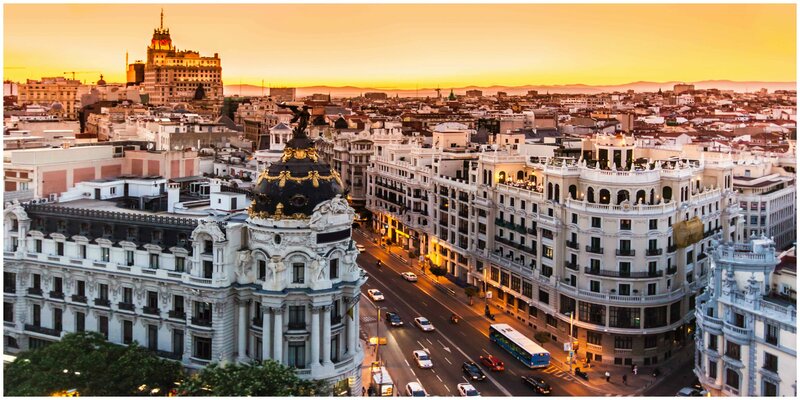 in case you find yourself in the capital of spain, overwhelmed by the increasing heat, you may want to find interesting and exciting places where you can spend your days and prepare for even hotter madrid nightlife.. there is certainly a number of great options for any taste, however, in this artice we have prepared a little insight into what the city can offer to travellers interested in culture and art. first of all we want to encourage you to explore the so-called the golden triangle of art which consists of three art museums that are among the most important museums in the world: the prado museum (museo del prado), the reina sofía museum (museo nacional centro de arte reina sofía) and the thyssen-bornemisza museum (museo thyssen-bornemisza). the prado museum, is among the most prestigious art museums in the world, storing more than 8000 masterpieces from the spanish, flemish and italian schools, starting from the middle ages to the 19th century. meninas” by velázquez which happens to bealso the best-known work displayed at the museum. in addition to permanent exhibitions this summer you can also enjoy two temporary exhibitions: “el greco and modern painting” and “evil vanishes. egusquiza and wagner´s parsifal in the museo del prado”. the museum is located on paseo de prado, with the nearest metro stations being banco de españa and atocha. the opening hours from monday to saturday are from 10am to 8pm; on sundays and holidays from 10am to 7pm. the next museum on the “art walk” list is the reina sofía museum , which is the house for around 20´000 masterpieces, dating from late 19th century to today. once there you must definitely see the masterpiece “el guernica” by pablo picasso. 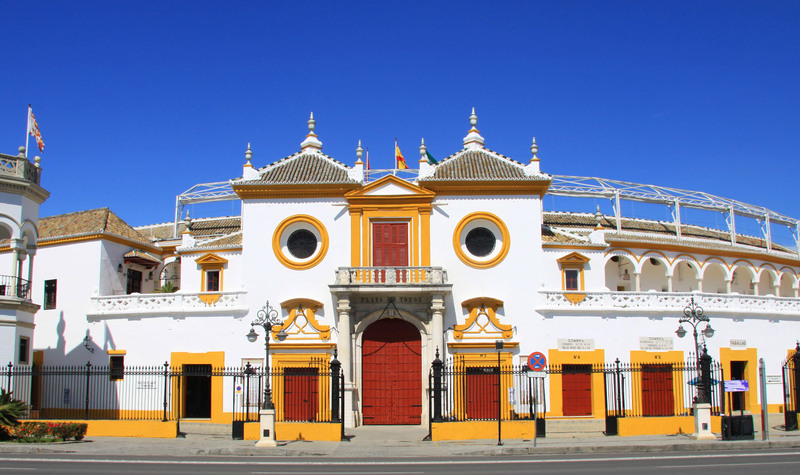 museum also has an extensive collection of other spanish artists, such as as joan miró and salvador dalí. nevertheless, if you are more interested in international artists,. the collections also include works by artists like francis bacon, damien hirst, max ernst, lucio fontana, etc. the programme of museum includes all types of artistic disciplines, divided into three collections: “the irruption of the 20th century, utopia and conflicto (1900-1945)”, “is the war over? art in a divided world (1945-1968)” and “from revolt to postmodernity (1962-1982)”. ilton and kerry james marshall. 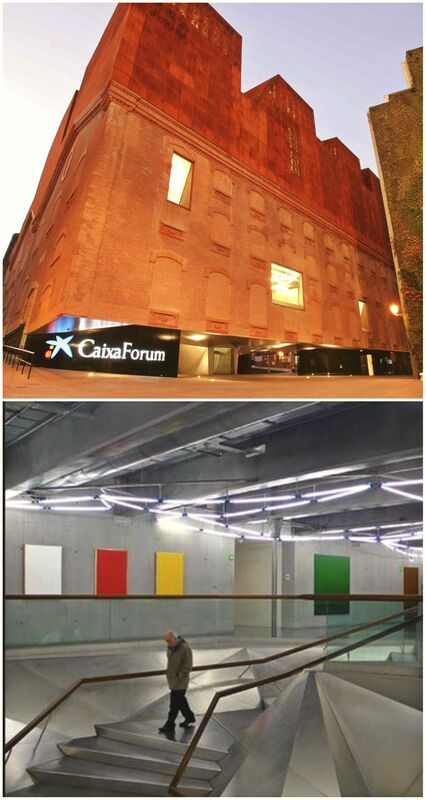 the museum is located on street santa isabel, 52 with the closest metro station being atocha. opening hours from monday to saturday are 10am – 9pm, on sunday 10am – 7 pm. the museum is closed on tuesdays. last but not the least important museum in the golden triangle of art is the thyssen – bornemisza museum which housesaround 1000 ar tworks from the 13th to 20th century. 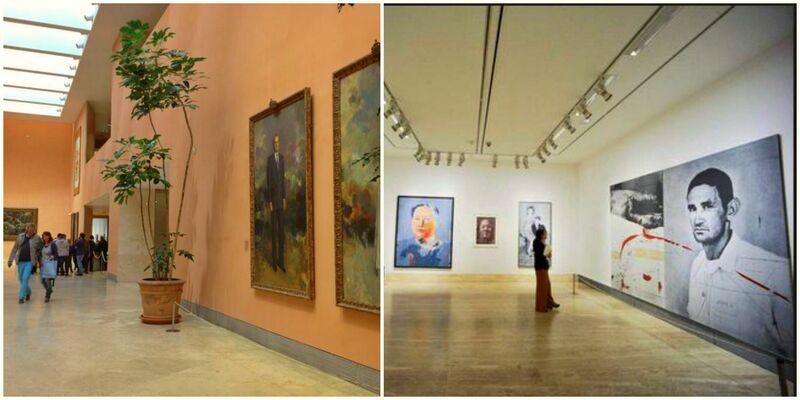 it is interesting to note that the museum initially started of as a personal collection by baron hans heinrich thyssen-bornemisza and his father, baron heinrich. thyssen supplements the madrid´s art temple with unique works of such underrepresented areas as the early italian school, impressionism, german expressionism, russian constructivism, , pop art, etc. if you visit thyssen this summer, you have the opportunity to see two temporary exhibitions, a mixture of conventional and contextual exhibitions. these are – “pop art myths” and “alma-tadema and victorian painting in the pérez-simón collection”. 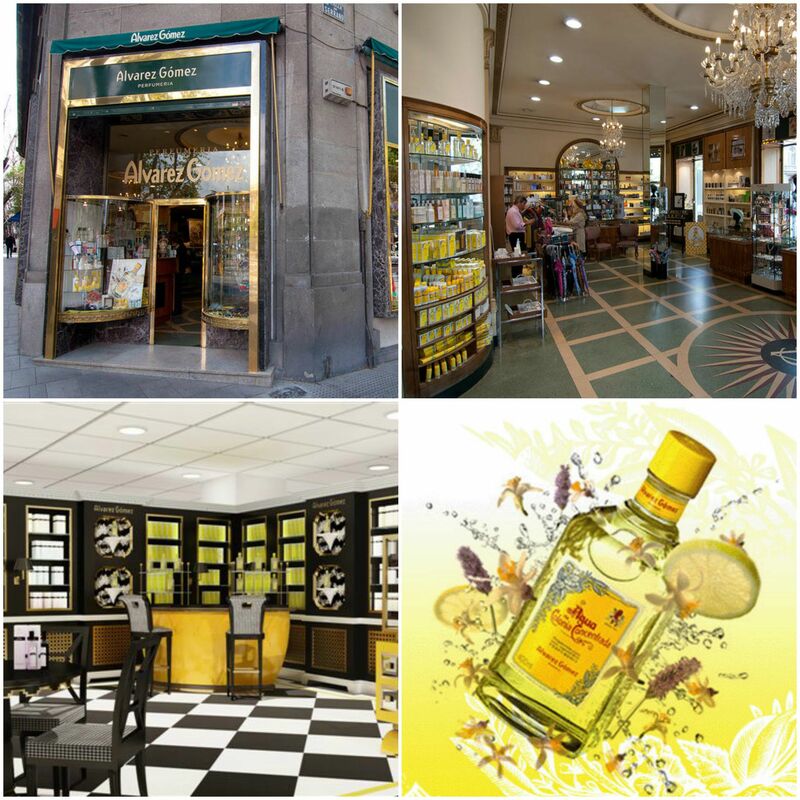 thyssen is located in palacio de villahermosa, paseo del prado, 8 which is near the metro station banco de españa. until september 14 the temporary exhibitions are open from 10am to 10pm on tuesdays to saturdays and from 10am to 7pm on sundays and mondays. although the three aforementioned museums are the very cornerstones of madrid´s art collections there are even more interesting cultural places to see, e.g. 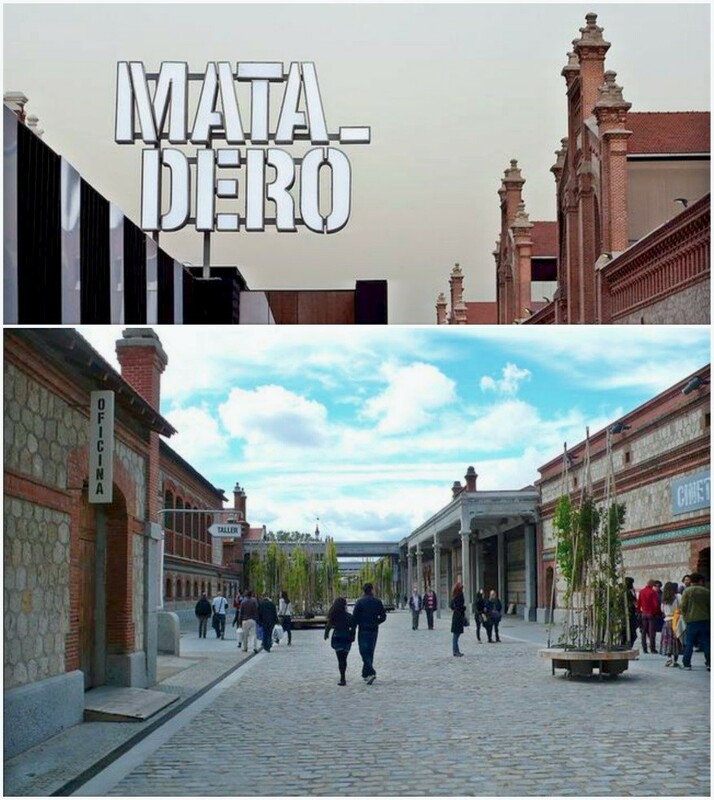 the arts centre matadero or caixaforum – the live space for old, modern and contemporary art, music and poetry . 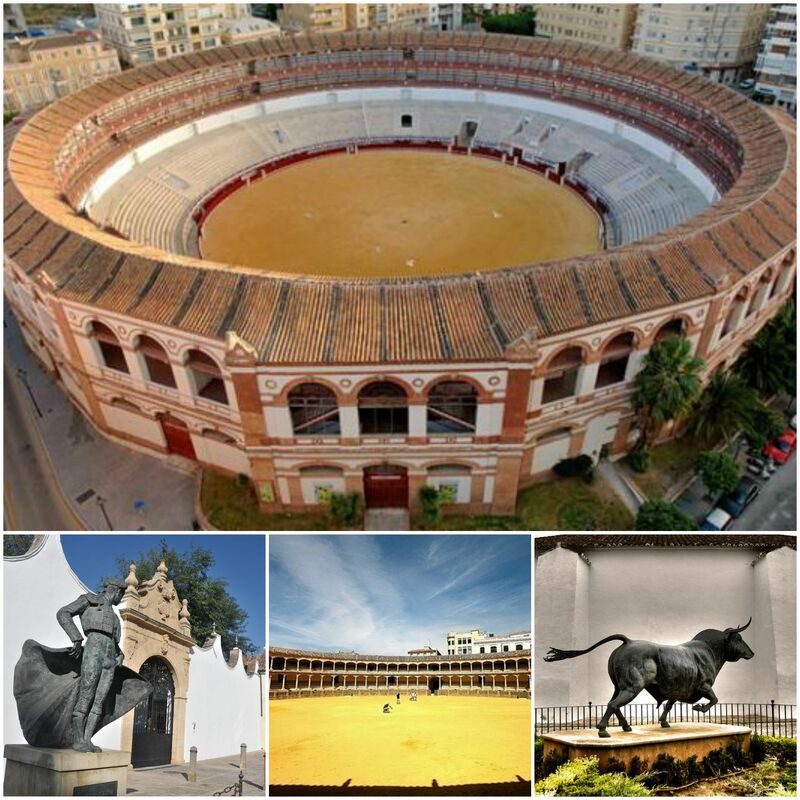 across spain would like to invite you to be our guest and explore the never-ending artistic and cultural opportunities the city has to offer, be it either by yourself or by choosing any of our several guided tours and art gallery routes. 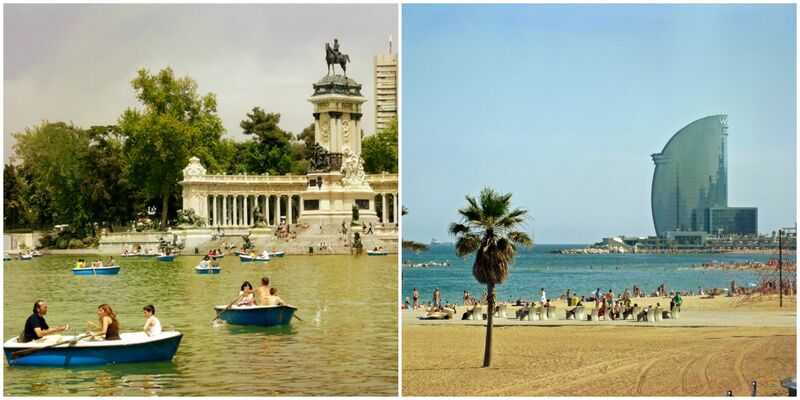 hot summer in spain – madrid or barcelona, what can be better? 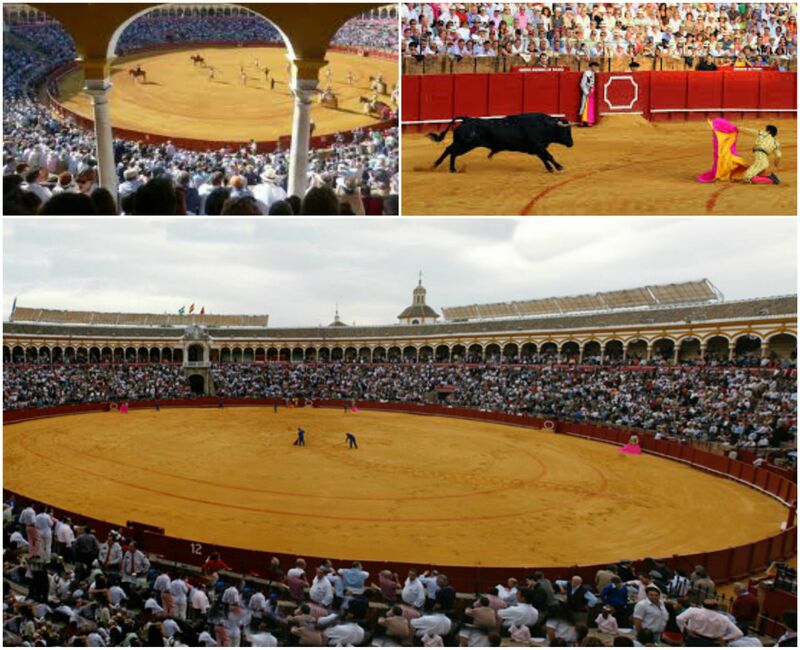 enjoy warm sea and cosmopolitan city of catalonia or walk through the emblematic sunny streets of madrid. however when it gets too hot, better to put on sun cream and panama hat, or hide from the heat in some cool place, to avoid catching a sun strike. barcelona and madrid give you unique opportunity not just to escape from heat, but to experience a small northern adventure without going far away – and even see the northern lights! how is this possible you will ask? – check it out! opened in 2007, this ice-place suggests its visitors to get unique northern experience, just at the sandy beach of barceloneta. ice bar is a wonderful place to be amused both for locals and tourists: lightened ice sculptures, ice interiors are forming two areas that are ready to welcome visitors and provide perfect place for fun and unusual celebration. entrance ticket (don’t forget to make pre-booking!) for the price of 15 eu provides you with 45 minutes visit and drink, that will warm you up. at the entrance you will get jacket and gloves, but better take some extra clothing with you if you are and easy freezing person. temperature in the bar varies from -2oc to -10oc depending on the bar occupancy. 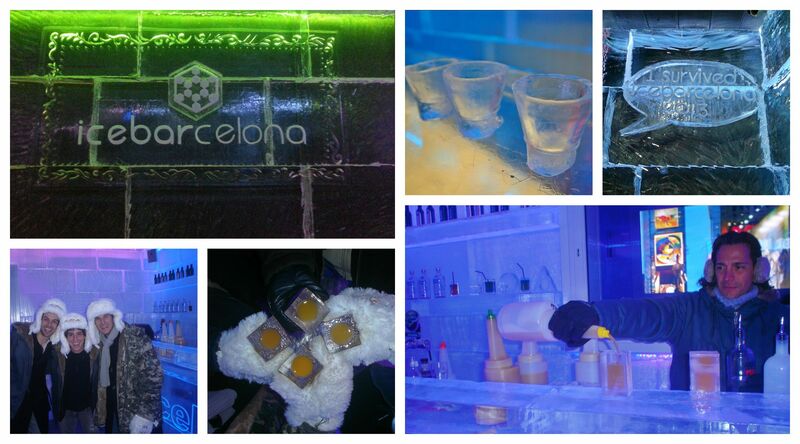 ice bar in madrid presents more intimate atmosphere and is a good place for any kind of event or celebration. the ice bar has a number of packages to book for perfect event that you will remember for years! package for vip clients, ¨love package¨, ¨photography package¨, ¨vodka tasting package¨, ¨celebrations package¨. moreover in the bar there is an ice shop, offering you a number of exclusive products related with the ice world. and last but not the least! madrid ice bar can surprise you with a unique show of northern lights, prepared by the brightest video and photography specialists together with the ice bar members. and take rest from the summer heat in the ice-bar!